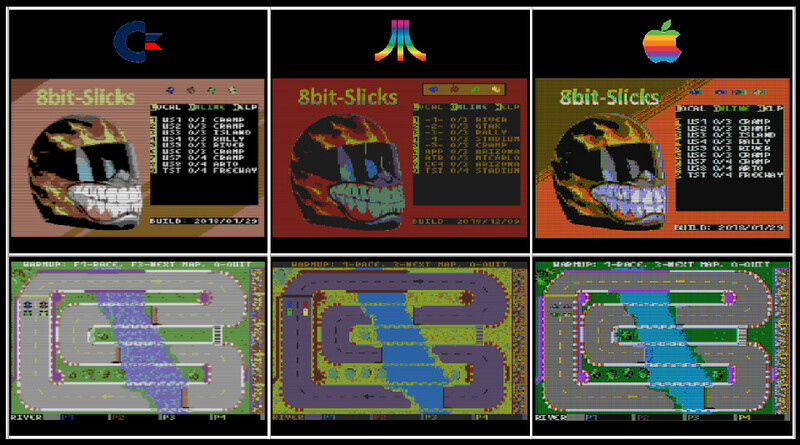 It was 18 months in the making... but finally I am pleased to announce the release of 8bit-Slicks for the Apple//e, Atari XL, and C64, just in time for the Xmas holiday! The game supports up-to 4 players, local or online (using the Uthernet, DragonCart or RR-Net). 13 games servers are available, and results are recorded for competitive Ranking. So make sure to download the game and join us for some racing fun this holiday season! P.S: Feel free to repost this news and spread the word, the more players online the merrrier!!! Last edited by 8bit-Dude on Tue Dec 18, 2018 1:56 am, edited 2 times in total. Really great work there, makes me wish I had a Dragon Cart for my Atari! So, I created the original music for the C64... Then did a conversion of the tune for the Atari 8-bit version. The Apple Music is still in development but will be added as an update. ...and I made your task all that much easier by sending you a very old manual from 1982! Are you doing the Apple music with the built in speaker or will there be sound card support? The former is a bit limited, but you ought to be able to do a reasonable rendition of the C64 music on a Mockingboard or MC1. We are using ElectricDuet to write the sound track. And lucky us, someone already wrote routines for playing those tracks on speaker, cricket or mockingboard!! Sounds good. I'm looking forward to it.